Need an 8K Beginner Training Plan? New to running, coming back from a long break or hoping to give it a try but not sure where to start? Introducing your Couch to 8K Program…. By request I have designed a couch to 8k plan that will successfully take you from the couch to an 8k finish line in two months. That is just in time for the Richmond 8K on November 11th. I’m really excited to offer this because the program is perfect for those beginners or coming off from a long layoff who are looking for a program compatible with a busy life! I confess, at first I was reluctant to build a “training plan” because personalized coaching is what I love! However, I designed what I wished existed. I created something awesome that I would have LOVED to have when I was first getting into running. 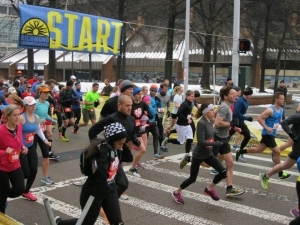 We all need to start somewhere and I am happy to help others get the opportunity to become a runner with an 8k race finish OR to reignite that spark for running! I remember what it was like to be overwhelmed. If you are looking for a program that is do-able, flexible, and in line with reality to help you get to your goals I have you covered! Your first session puts you on the couch (reviewing the plan and relaxing to start off) and builds you up from there with walking and running. The first session only requires 3 minutes of continuous easy running at a time. Just 3 minutes at a time. Practically ANYONE can do this! If you want to be a feel that joy at your 8k finish line check out the plan now! The program is full of tips, strategies and variety to keep you motivated and learning. We will gradually build your fitness level and transform you into a real runner! In order to provide an awesome training log to track all of your progress I have made this plan available through Training Peaks. The account created upon purchasing the plan will always be yours and you can continue to use it long after the race. You will also receive details on joining our community of Facebook. November 11th is a huge weekend celebration with 3 race distances and also a Key Race for Track Cat Fitness athletes. We will have a meet up celebration for us to connect in person after the race! When we say we are inclusive & open at Track Cat Fitness…we mean it. We want everyone to have that opportunity to experience the joy of running & racing. Message a Track Cat team member or contact me here for a discount code on this Couch to 8K Beginner Training plan!